A quick blog from Meise, Belgium at the Pro-iBiosphere wrap-up event. I’ve had a lot of great feedback and interest in what I’m doing with this. 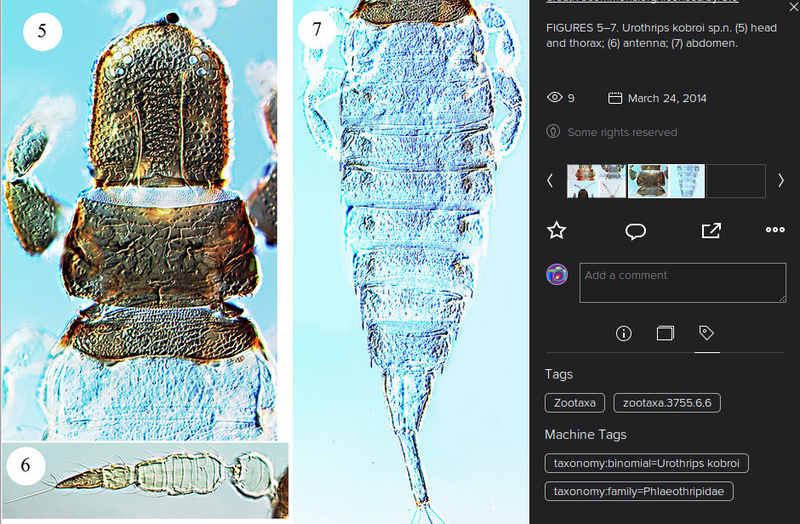 Cyndy Parr has pointed out that EOL are on Flickr too, and have been marking-up photographs of taxa with ‘machine tags‘. Jeremy Miller from Naturalis is also very interested in OA Zootaxa content from the point of view of spiders. He gave a talk on Data Visualization on behalf of his team from the Leiden hackday. Luckily, with no prior ‘special’ mark-up, by searching ‘Araneae‘ I could show Jeremy the promise of what I’m doing on Flickr. Many phylogenies containing spider taxa came up in the search, many of which he immediately recognized as from his own open access publications! With a little bit of work to further mark-up the attributes he’s interested in, I might be able to provide something of real use – the ability to search figure images/captions across hundreds of open access journals, from many different publishers with just ONE search! The Bouchout Declaration will be launched today at this meeting. I’m happy to say I facilitated the signing of this declaration by Open Knowledge. Many other organisations have signed this declaration and I hope it makes a splash – we need science to be open to do good science! Finally, I’ve also potentially got a new research collaboration going (more of which later!). It’s been well worth the trip!